Rena and Rex: Teddy bears aren't stupid. **R1 = Rena, R2 = Rex. r2 - "Go away brat." r2 - "okay then, I'll go get mom." r1 - "Hey, Rex i brought some dollies and teddy bears, maybe you'd like to play with them too, they are fun to play with, this is Jillia--"
r2 - "Rena, I don't wanna play with your stupid teddy bears, and dumb dollies, go play in your room by yourself, your no fun, now go away." r1 - "I HATE YOU!"... and I smashed his T.V screen, and game system. r1 - "NEVER EVER CALL ME NO FUN, AND BORING, AND DON'T CALL TEDDY BEAR STUPID, OR JILLIAN! THEY'RE BETTER THAN YOU I LOVE THEM MORE THAN YOU, I HATE YOU!" r2 - "...you hate me?" r1 - "...yes. I hate you. Your the worse bubby ever." 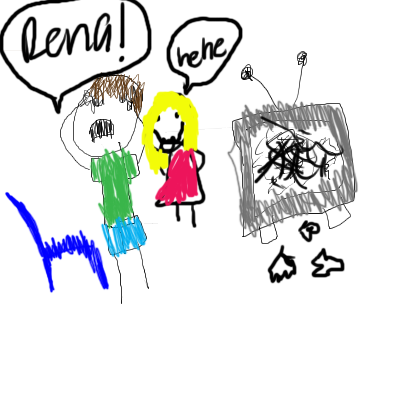 r2 - "oh Rena! I'm sorry!" r1 - "I gave you lots of chances to be a good bubby, but you took them and swallowed them, you yelled and screamed, and ... i hate you." That's when I really felt good, I told him I hated him, and he shriveled up like a little itsy bitsy spider on the wall. I hated him, and I still do.